Take the HD video tour now by clicking HERE! 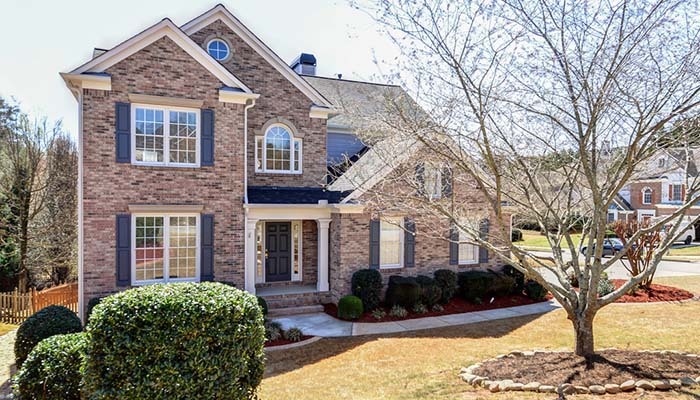 This beautiful 5BR/4BA home is nestled on a corner lot and features a side entry 2-car garage. The hardwood floors lead from the 2-story entry to the family room with fireplace and built-in cabinetry, all awash in gorgeous natural light from oversized windows overlooking the fenced backyard, sunroom and views of the community lake. It includes a living room, dining room, open kitchen with pantry, breakfast bar, breakfast area, guest bedroom and a full bath on the main level plus a laundry room. The master suite with spa-inspired bath and huge walk-in closet is separated by a catwalk for supreme privacy on the upper level to the two other bedrooms and a Jack & Jill bath. The full finished basement includes a recreation room, wet bar, media room with tiered floor, built-in speakers and media storage, a sunroom plus French doors that lead to a perfect home office. An additional bedroom and full bath are on the terrace level as well; easily convert to an in-law suite! Community features a swimming pool, tennis, clubhouse and a playground. The Silver Comet Trail nearby has 61 miles of paved trails to explore as well. This home includes brand new carpet and paint, stainless steel appliances and garage door purchased in 2015, new roof installed in 2011, and 3 A/C units – 1 for each floor. Welcome to you your new home!